Galganov's Free and Easy Recipe for Instant Vegetable Soup! Almost as fast as a can with none of the tin cans or paper labels! Put two cups of water in the pot and set at medium to medium-high heat. Add to it - diced onion, tomato, celery and carrot. (optional) By this time water is boiling - add noodles (if using uncooked) and stir in - check package cooking guidelines. Add a pinch or so of salt (or to taste). Add any herbs you prefer (we use parsley and basil). (non-vegetarian/non-kosher optional) Add shrimp or other "five-minute" ingredients ... or other pre-cooked/quick cooking meat. Add frozen peas (or other commercially frozen vegetables) for last 3 minutes. Stir well and bring back to boiling. Over time you will increase or decrease the amount of any ingredients you use. When we want a more robust taste we may use a larger tomato or even an extra tomato. Any time you change it up you make if fun. Got a bit of cabbage in the fridge? Shred up just a bit. This is a good foundation recipe for two Instant, healthy, tasty, warm and satisfying, soup-plate sized portions of vegetable soup ... and so easily vegan. More about Vegetable Soup: Everything is optional! It is vegan (a fantastic, flexible and considerate option) but you can make it meat by adding meat to any given bowl ... or you can make it dairy by adding diced cheese or curds to your prepared plate - and you still have the vegan base ... or make the soup what ever you want it to be! Tomato is, essentially, the base for this easy to make, satisfying vegetable soup. In its fastest, easiest form it is a vegan dish which can be ready, in about 10 minutes, to serve two people. Still, if you don't like/eat tomato, find your base flavour elsewhere. Celery tops add, generously, to the flavour of a broth. Mince them finely and send them into the pot. Once a soup is non-vegetarian, it's non-veg. 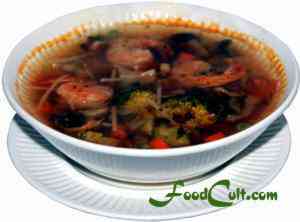 Once any form of meat has hit the pot, that soup is not vegetable soup, it is a meat-vegetable soup. Once cheese has gone into that pot, that is a dairy soup. Certain addiitions can be made at the plate leaving the soup, still, a vegan delight! In as little as 10 minutes ... fresh, hot soup! Growing up, I thought "Vegetable soup comes from a can." It was something that is ready in 10 minutes. You opened the can, put the contents in a pot with water ... and today, we rinse the can and, sometimes, peel the label. By the time it's in the bowl, 10 minutes has elapsed. One day, as a teenager, I lunched at a schoolmate's home. His grandmother made vegetable soup. I thought, "Wow, it's good ... and not from a can." We went on to make vegetable soup (just as was normal to make chicken soup) at home. One day, preparing lunch, we needed something fast, hot and tasty ... and being out of canned soups (and lentil soup takes about 1/2 hour) out came most of a started tomato, a piece of carrot, what was left of a celery stick, some brocolli ... what was in the fridge dictated the soup. There are always mushrooms so, in went a couple. On that day, there was a little left-over rice in the fridge and it became a "vegetable-rice" soup. This soup is inherent flexibility in that it readily takes in a little left-over rice or noodles ... or so many things! Enjoy it as a hot, vegan soup - its nature is vegan (and, so, always kosher/halal and pareve). Toss some slender pasta (ie, vermicelli or spaghettini) in for last last seven minutes or udon noodles in the last four or five minutes. (Check noodle package for instructions. Some noodles are done in as little as a minute or two.) ... Or simply put some left-over noodles or rice into the pot for the last minute (just to reheat them). Turn your soup into a chicken-vegetable soup - dice in some chicken from the fridge ... or some roasted beef - for a heartier, beef-n-vegetable soup. Raw shrimp (about 3 per person) can be placed under light, cool running water and will be defrosted and ready to cook by the time your pot is ready for them (in under 5 minutes). Put them into your soup for the last 5 minutes ... and with 3 minutes left, frozen peas will retain their snap. Let your imagination (and what your fridge holds) take a walk through the garden of ideas. I like to put a little chili paste into the bottom of the bowl ... to spice up the broth (but I don't like to cook chili paste into this dish - just as I, personally, don't use ground pepper in this soup). Salt and pepper can always be added at the table - you can't take it out of a dish. Making a dinner portion of this soup ... or a couple of servings takes as much as 20 minutes if you're disorganized (or pick ingredients that take long like uncooked rice or raw meat - or a big piece of potato. Certain pastas make take longer as well. With practice and a little luck as to what is in the fridge, a vegan version of this soup can be ready in about 7 minutes. You can always go get some Wallpaper Originals' Free Food Desktop Wallpapers for MacT & PC - now that you've found the web's best and easiest Clear Chicken Soup Recipe.